I don't have a photo of the Pont Marie (on the other side of the Ile Saint Louis from the Pont de Tournelle). However, I do have a photo of the Pont de l'Archeveche (the archbishop's bridge), just downstream from the Pont de Tournelle. This bridge is 68 m long, 17 m wide, and 11 m above the Seine. It was built in 1828 by the engineer Plouard. It is a three span, stone masonry, deck arch. 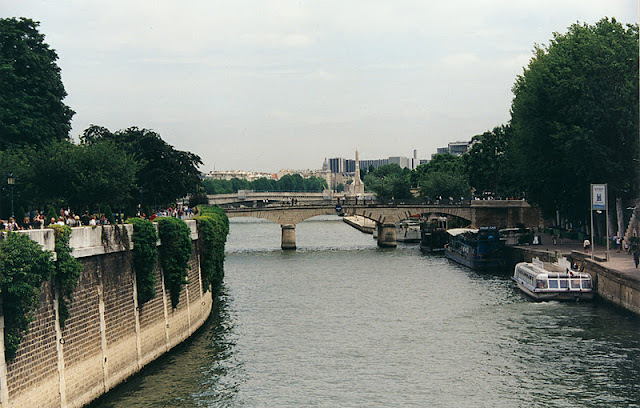 Seine River Bridges: Pont de l'Archeveche by Mark Yashinsky is licensed under a Creative Commons Attribution-NonCommercial-ShareAlike 3.0 United States License.